I have done some research & have found a video of Dr. Roger Leir (below) removing what he called “alien implants“. I have no idea of the origin of the implants that I discovered in 2008. 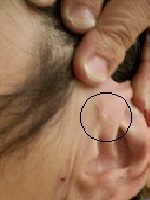 In the video, he shows that these implants emanate radio frequencies. Sadly Dr. Leir is now deceased. It is my sincere hope that another doctor will come forward to help those of us who were implanted without consent. “Harrison Bergeron” is the Kurt Vonnegut short story that the new movie, “2081” is based on. See this 1995 adaptation of the story at this link, in 12 parts. In 2009, I was told by a complete stranger on the street that I was “sold into slavery”. Given the events of my life, and the fact that I was adopted through a Catholic agency, it is not out of the realm of possibility. It did not take me much research to learn of the history Catholic organizations have with child trafficking, dating back in the 1960s, at least. I have been told that I was sold into slavery with the specific purpose of being a ritual sacrifice. There is no justification for what was done to me. There may be more to be added to this document in the future, but I wanted to get it out before I die, or am imprisoned for some crime I haven’t committed. I fear this might be done in order to silence me. I have found myself to be a TI (Targeted Individual), but given the events in my life, I feel I have always been a target. don’t know if my birth mother was from some bloodline or not. I don’t know the circumstances surrounding my adoption. Just being adopted through a catholic agency puts one at risk for being stolen, which then puts one at risk for becoming an unwitting participant in a human experimentation program. Of course, I am not implying that all adoptees are victims of nonconsensual human experimentation, only that they are at a greater risk for it, since their records are often sealed. After seeing a show on TV where a baby was being taken from its mother, I wondered if I cried like that was I was taken from my birth mother. These are photos of my implants…. 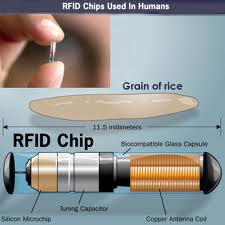 This is an image I found at “lovingenergies.com”, showing the size of RFID chips. The implants in my ears are exactly that size. It should be noted here that the word “psyche” refers to the spirit, in both Greek & Latin. Thus psychology most likely refers to the study of the spirit, but they don’t tell you that in school. Keloids (photo shown right) are ON the skin, while what I have is clearly UNDER the skin. I hear voices through the implants, and I also feel what can only be described as “impact sensations” through them. 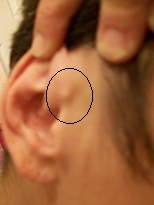 I had one person tell me that they were cutaneous horns, but those are also on the surface of the skin, not under it. Given the fact that I was adopted through a catholic agency, it is very possible that these implants have been with me my whole life, since the Catholic church certainly has more than one black mark on it’s record concerning it’s treatment of children. When I discovered my implants in 2008, began to uncover my memories, and notice how orchestrated my life has been, I became a target for the worst kind of character assassination. I lost my job, my family, my world. I was abandoned in a foreclosed house, in which I lived with no power or water for almost 3 years. No one would help me, and the only way I could get a ride, or a warm place to stay during the coldest winter nights was if I allowed certain men to kiss and/or touch me. I believe the implants in my head have been a major part of my problem throughout my life, & that, had I not been implanted, my life would have turned out very differently. A little research into the work of Dr.s Jose Delgado & Ewen Cameron (to name a couple), whose work in mind control goes as far back as the 1940s in some cases, will show that this is indeed possible. It is not only possible, but very likely, that these implants have been delivering subliminal messages throughout my life, or at least throughout their existence in my head. The proof is in the photos above. No one can say I am delusional regarding their existence or their placement in my head. I hear voices throughout them telling me I am a demon, or Satan himself, and that I am being killed & sent to hell. How’s that for a mind #@*!? I also hear high-pitched tones (on one side or the other-not ringing), and feel impact sensations, coming through these implants that I cannot seem to get a doctor to look at. Sometimes, the voices will tell me I am going to be framed for something, but I am a completely law-abiding citizen. Voices that were once subliminal are now broadcast 247 into my head to keep me in terror by calling me a criminal even though I am breaking no laws, telling me I am marked for death, going to jail, that I am just food, etc. At one point, I was at an amusement park with my daughter watching a show, when I felt a directed energy weapon attack: it felt like a hot poker going into my back and straight through my left lung, which I am sure is done to make it look like I died of lung cancer. I must be a victim of either MK Ultra or the Monarch program, not only because I have these implants, not only because I had the classic near-drowning at 3y/o, or have had programming terms spill out into my conscious mind, but because it simply looks like my entire life has been orchestrated for the specific purpose of making me negative and to turn me away from God. At any rate, I can show that I have not been allowed much “freewill”, and its ending result was one of catastrophe. I am not even sure “freewill” even exists, hence the quotations. I urge any target reading this to read it completely, and then examine your own life to see how you may have been manipulated in relation to your name and/or birthdate, especially in regards to music and movies, as well as the tarot, used as a programming device, as opposed to a fortune-telling device. I am the victim of what can only be called Mind Control, regardless of what program was used. Taken separately, the events of my life may not look like Mind Control to most people, but when considered together, it cannot be denied that what happened to me was a classic PSYOPS experience or experiment, resembling The Truman Show, except in my case, I was debased, debilitated, and dehumanized on a fundamental level, whereas in the movie, they show the main character was raised by loving and attentive parents. After what I have learned about myself, and what I have witnessed in this country and the world, I am now forced to consider that the kinds of things that were done to me are occurring, in some level (even if a more subtle level), on a global scale, in order to make the whole of society unbalanced and unwell, and thereby easily manipulated by the hidden ones in power and the power structure. I am not writing this to disrespect my parents, which will be seen as my story continues below, as I know they too were controlled by this machine. I have learned that certain occult brotherhoods, interested in making blood sacrifices, will force a woman to give birth on a certain day. I believe that my birthmother was more than likely induced to have me on 12/12, because of the predominance of that number in our culture, and its association in most tarot decks. I was adopted at 6 weeks, but I remember a photo of my father holding me and I looked like a newborn, which makes me think I was premature. They would do this to make sure that I would be weak and more easily manipulated. The classic near-drowning at 3 years old, which I will document below, is known to be used in mind control & ritual abuse. Trauma such as this causes actual changes within the brain. I believe that the ritual drowning at 3y/o is done on purpose to contribute to destroying people’s true potential & making them easier to control. Adoption itself is a trauma, in that it is not natural for a baby to be separated from their natural parents at birth. Another thing that shows I was manipulated to be negative is the fact that I was forced to write with the right hand, against my natural inclination to be left-handed. This was done by telling me, when I was learning to write, that left-handedness was evil. If the right hemisphere of the brain generally controls the left side of the body, as evidenced in studies of stroke victims, what does this imply for someone who is naturally left-handed, but forced to be right-handed? Is it possible that doing this to me could have “switched my poles”, causing a bright and intelligent child to slowly lose her natural God given gifts? Is it also possible that switching someone’s natural handedness could make them negative, less intelligent, unbalanced, and emotionally unstable? I believe it should be looked into. I believe that changing my natural, God given, left-handed nature caused me to lose ambition, creating a state of apathy & confusion, over time, and is at least partly responsible for my negativity. This is evidenced by the fact that when I was in grade school, I had a high IQ, and was in the top 2% of my class, but over time, my grades fell dramatically. I was lucky to graduate high school with a C average. While my mother’s negative influence in my life is, of course, partly responsible for this, I would have most likely been more self-motivated, had I been allowed to keep my natural left-handedness. This could also have something to do with what I document next. There are many who believe that the tarot can be used to tell someone’s future, and others who would say it is meant to help people work through their psychological issues, but given my story, and how much it relates to a certain tarot deck (A. Crowley’s Thoth deck), I find myself thinking that these images had an unnatural and cruel programming type of an effect on my life, as did many other things in art, music, movies, and TV. After a certain amount of detective work, I have learned why. As I mentioned earlier, I was born on 12/12/1967. I think it is very possible that the assignment of the number 12 in the trumps of almost every tarot deck, in addition to the prevalence of the number 12 in the bible and in culture, has also had a subliminal effect on me throughout my life, having a specific impact on my ego. 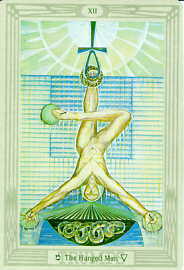 In the tarot, the 12th card of the major arcana is usually The Hanged Man, an upsidedown person. Due to the patterns of my life closely relating to the Thoth deck, I feel that I may have been programmed with it. I have met one other person with a 12/12 birthdate, and he also feels like his whole life has been cursed. I certainly cannot deny the possibility, given the fact that my adoptive mother, born on 4/4, had a life that mimics exactly the 4th trump in that deck. In the Thoth deck, the Hanged Man’s right foot is tied to an upsidedown Ankh, which is the Egyptian symbol for life and fertility. I find it sad that my ideas about life and fertility were always skewed in this way, although I had not known about this card for the majority of my life. As far as I know, I had never seen it, however, I must now question if I was shown this card in my youth, as some part of a mind control program. I only say this because of its serious and deleterious effect on my life. While I knew of my birthdate, I never really associated myself to that number on a conscious level, rather I have always identified with the number 3, possibly because I was baptized Catholic and received first communion. I have to wonder if being born on this birthdate has affected others in similar ways, but I suspect that it depends on how the person is raised (including trauma in early childhood) in addition to their birthdate, name, numerology, tarot correspondences, and astrological sign, in addition to whether they were part of this mind control program that I seem to have been put through. When one takes into account the occult nature of those who would be involved in such practices as MK Ultra and the Monarch Program, it is very possible that the tarot was used in conjunction with dark magic and mindcontrol, to create a peculiar pattern in my life that closely resembled the energy of the Hanged Man card throughout most of my life, causing me to blame God for everything in my life, turn away from the church given its history of killings and hypocrisy, and eventually sign a contract with a character named Enki (a Sumerian god), whom I was mindcontrolled into believing was the true God. I was only searching for the One True God of the Universe, and everything the churches were seen to be doing turned me away from them. By forcing my life into such a negative pattern (inverted-like the Hanged Man card), as you will see if you read this whole document, it was easy to turn me away from the God of the bible, making me believe that the bible lied. Given how the images from the tarot have affected me & other people I know, however, I now understand why the second commandment in the Bible states, “No Graven Images“. This is about something called “archetypal transference“. While it seems that we have all been mind controlled to some degree, I see my case as slightly different from most people, only because of my mother’s 4/4 birthdate and my 12/12 birthdate, and how they were used against me. My mother’s card, The Emperor has so many symbols relating to her life that it was impossible for me to ignore. There are two rams (Aries) behind her (they “had her back” so to speak): the one on the left, representing my father, who always took care of her even after the divorce; and the ghostly one on the right, my grandmother who is deceased. The figure has one 8-point star in a circle (eight balls?) on either side, which represent my cousin and my brother, both born in August, whom she regarded fondly. The lamb at the bottom, represents me, from whom she was always looking away. This lamb is holding a flag, & one could say I was a flag waver for certain causes, such as Greenpeace (back in the 1980s). The Emperor is holding a ball with an equal-armed cross on it, so it is a coincidence that my mom was a trophy-winning bowler? In my case, The Hanged Man is nailed down and unconscious, symbolizing how I have been unaware of what has been happening to me my entire life. Already mentioned is the fact that the figure is hanging upsidedown, from the Egyptian symbol for life and fertility, which shows how my entire life has been inverted. The fact that the figure has no clearly definable genitalia (just a lump of flesh in that position), is significant of castration, symbolic of the pain I am in today and have been suffering from since the middle of 2008. The serpent in the card represents the serpent class (or satan), connected via rays to the figure’s head, makes it seem that they are able to read my thoughts, to be displayed in some altered form, in movies, TV, but especially in music. One example of how my life has been played out in some form, in music, can be seen in the Beatles’ song, “While My Guitar Gently Weeps”, where George Harrison sings: “I don’t know how you were inverted.” Another example would be the Kate Bush song, “Experiment IV” (4th trump=Emperor), in which she describes “a sound that could kill someone from a distance”, which relates to all the negative energies sent to me from my adoptive mother with that 4/4 birthdate. It is already well known that mind control is often addressed in music & movies. One thing I want to note here is that the things they are doing to mind control victims are played out in music in movies, so that when anyone complains of the effects of targeting and mind control, they can be dismissed as delusional (“Ah, you’ve been watching too many movies, man”). However, all one has to do is see how, even some political candidates, such as Connie Marshall (KY), and celebrities, such as Randy Quaid (his case told on YouTube), are now complaining of targeting, to understand that this is anything but a delusion. For some good information on targeting, see: http://hrvcanada.blogspot.com/2011/10/connie-marshall.html. It was not long after I discovered the effect on me from the tarot that I began to see the symbolism in certain words. Notice, for example, the following words: Bill, chill, mill, kill, till, all have the root words “ill” in them; and how the words bow, chow, cow, pow, sow, all have the root “ow” in them. It might mean nothing, yet it could still have a subliminal effect. I looked up the word “music” as two distinct words; mu and sic. Taken individually, they are defined as follows: Mu– 12th letter of the Greek alphabet, a lost continent in the Pacific Ocean, an opiate receptor, among many other things, and is a root in many words in the English language; and Sic– Intentionally so written, As written, A command to attack (as in “sic the dog”). That being said, one also has to take into consideration the sound of the word, “music”, as in “muse sick”. When I think of these definitions, and the way my life has been, I realize that my life seems orchestrated by some unknown entity, and I am praying that God would not do this to an individual. For example, my initials happen to spell “cat” (although my mother has confessed to not really liking cats), and when I was in school to be an artist, a woman entered that school, with the last name of “Skinner”, and somehow she was able to end up with many of my ideas without me telling her. I see this as related to the phrase, “skin the cat”. Later, she would introduce me to heroin at a vulnerable time in my life, which helped to ruin my career & my life. survivors of the Monarch program are given “cat alters”, although I am not a multiple personality. I do think I have repressed memories, since I have heard programming break through to my conscious mind. I am a Mind Control victim who was adopted (as some would say, “sold into slavery“) through Catholic Charities, but was held in the agency’s custody for the first six weeks of my life, creating an attachment disorder, causing me to be a very emotionally needy child. Unfortunately, my adoptive parents were either unable or unwilling to fill this need. I ask myself why my mother would me name me something with the initials spelling CAT, when she never really liked cats. My parents had a natural born, ten year old boy when I was adopted. My mother’s maiden name was Gaeta, so when she married, it became Nay Gaeta “negator”, which is a cruel symbolic irony regarding the effect she had on my life. She was in her thirties when I was adopted. She smoked three packs of cigarettes a day, which is possibly why she had two miscarriages before I was born. She used a method of child-rearing, common in the 1960s, which advocated leaving the child to cry and/or scream for hours in the crib without responding. This method of caring for a baby is cruel, and I cannot imagine why anyone who loved their children would do this. I am sure that it causes or contributes what is known as “attachment disorder”. My parents were upper middle class, so in the absence of love, they gave me material things. My father, working a job that kept him out of town frequently, wasn’t around much, and I felt his absence. Although she seldom had to work, my mother was also never around much, leaving the raising of me up to myself, and various nannies that would come and go during the first nine years of my life. My brother, who was ten years older than me, was usually away at boarding school. I had the classic near-drowning at 3 years old (common among Ritual Abuse victims), and I am told that my brother saved my life when I was found floating face-down in the pool, although considering the accounts of RA victims and participants (who are also victims) throughout the world, I now have no idea what the real truth is. In any case, it is possible that this was a ritual drowning, done to bring me to a near death experience, which would then allow for spiritual and demonic influence in my life, and/or easier mind control. My brother has told me that our mother was caught shaking him when he was a baby, and had to be watched, which is why we ended up with nannies during the first eight or nine years of my life. If this is true, I have to wonder where our nanny was when I fell out of the crib during one of those times when I was left to scream in the crib, by myself. That being said, I do know that my mother had an obvious mean streak in her (The Emperor-remember), and I did witness her beating on my brother when I was around five, and he was fifteen. I know she was beaten by her own father, and I suspect she was sexually abused as well, so I am not trying to show disrespect for her or my father, as I know they were both victims of their own programming, as were their parents before them. My parents got divorced when I was around 9 years old, and I took it hard because I really needed my dad in my life. My dad moved out of state, and my mother and I moved out of the family home. We ended up in the place where I spent the second half of my childhood, in a literal house of mirrors. This is why I call it PSYOPS (PSYchological OPerationS), because living in a house of mirrors during my childhood had a direct psychological impact on me. We had mirrored bedroom suites, mirrored coffee table, mirrored wallpaper, a mirrored pedestal with a steel sculpture, mirrored sliding closet doors, mirrored shower doors, mirrored art on the wall, mirrored tissue dispensers, mirrored cotton ball holders, and even mirrored outlets and switch plates. I am not exaggerating here. There was only one room in the house that didn’t have this décor, and it still had one big mirror on the back wall, behind the bar. I know this had an effect on me as a child. After reading the book about mind control, by Fritz Springmeier & Cisco Wheeler, I learned about the use of mirrors in mind control, it just seems to have been done differently in my case. By the time I entered my teens, I became a rebel and got into the punk music scene, which only fueled the fire, so to speak. While I was never a racist, I did end up doing some very negative things, but I never committed murder. I was involved in some ugly behaviors with friends though, such as playing around in graveyards. The lack of a father figure left me easily influenced by boyfriends, throughout my life. Since my mother was never around when I was growing up, and when she was, she mostly gave negative feedback, I had very little encouragement, causing me to be lonely and angry. I felt bullied by her for the most part. She gave very little love, and just seemed to want to spend all her time with her friends. She was an avid bowler (see the image of the 4th trump of the Thoth deck above), and would drag me to smoke-filled bowling alleys. She smoked 3 packs of cigarettes a day throughout my infancy and childhood, keeping a smoke-filled home & car, which not only gave me asthma, but also a nicotine addiction. Instead of trying to reason with me, my mother would yell at me for bad behavior, with the following recurring theme: “You are stupid, stupid, stupid, and you’re never going to amount to anything!”, among other similar negative feedback patterns, which is, of course, more PSYOPS (as if the mirrors weren’t enough). I have forgiven my parents for what they did because I know they must be victims of their own programming, or were coerced into adopting me and leaving me alone throughout most of my childhood, possibly as part of the experiment. My parents may have been unwitting participants in the scheme that I have witnessed occurring in my life, being victims of their own upbringing, so I have forgiven them, but I cannot forget the fact that neither of my parents were around much when I was growing up, which caused me to be quite emotionally needy, a quality that helped to destroy my life before I ever had a chance. There are many children who have suffered through similar divorce effects in their lives, however, the implants, the mirrors, the near-drowning at 3y/o, the adoption, and the symbolism I have referenced are simply too much for me to chalk up to a “child of divorce syndrome”. Although I might’ve been guilty of taking a few dollars from my mother here and there, during my teen years, I never stole large amounts of cash from her. When I was 17 years old, however, I got accused of stealing her wallet, which had $800 cash and her credit cards. While I know I did not do this because I fell asleep and woke up on the phone with my boyfriend at the time, she allowed the police to take me in for questioning, who then coerced me into a false confession. I don’t know if the police just wanted a scapegoat, or if this was a part of PSYOPS done on me to make me fear police and other officials so I would be afraid to go to them for help. It also made me more of a rebel. This event helped to ruin my relationship with my mother. When I began to have memories resurface about mistreatment in my life, I became a target for what is known as PSYOPS, COINTELPRO, and Electronic Harassment. I began to hear voices through the implants on my head, done in order to discredit me. At first, they sent me positive messages, making me feel loved and cared for, but this soon turned to horrible and cruel words, designed to make me very sad and negative. Any professional I see wants to make me out to be schizophrenic, but won’t even do me the courtesy of getting these things on my head examined by a medical doctor. This tells me they are either in denial or are criminally negligent. My mother was involved in a class action lawsuit against the tobacco companies which was won back in 2008 (or so my brother told me). My mother has passed away, and during the height of my breakdown involving the voices coming through my implants, and while I was living in that foreclosed house without water or power, my brother got me to sign over executorship of my mother’s estate. This leads me to believe that something fishy is going on. If anyone cares, please say a prayer for me. While me standing to inherent a large sum of money that a particular tobacco company might not want to pay could be one reason for my targeting, the implants in my ears lead me to believe this has been going on since my early childhood. As noted, there may be more to this document to come, but I wanted to get it out before I die, or am imprisoned for some crime I haven’t committed. I fear this might be done in order to silence me. Adoptee Trauma: http://adoptionvoicesmagazine.com/adoptee-view/adoptee-view-what-can-a-tiny-baby-know/#.UwtMKrCPKUkmusicis2words All rights reserved. Presenter: “You did it! You’ve won a million dollars plus the bonus round!! Congratulations!!! Contestant & Partner get up and hug each other… Contestant jumps up & down… Balloons & streamers fall.